1 – 31 March and aftermath – Two members of the far-left group DHKP/C (Revolutionary People’s Liberation Party-Front) took prosecutor Mehmet Kıraz hostage, issuing a series of demands related to the Berkin Elvan case that Kıraz was investigating. (Elvan was the 14-year-old boy who was shot in the face with a gas canister by an as yet unidentified police officer during the Gezi Park protests and who died in a coma 9 months later.) After 6 hours of negotiations, a confrontation took place and both DHKP/C members and Kıraz were killed. During and after the crisis the Turkish government issued a media blackout regarding reporting on it. Though both pro-government and non-government-aligned outlets (the later coming from a variety of ideological perspectives but distinguished by the fact that they sometimes criticize the government) had carried images of the hostage crisis, the following day many of the non-aligned media were banned from attending Kıraz’s funeral and subsequently had charges filed against them for “propagandizing on behalf of a terrorist organization.” Some of these media organizations, including the Doğan Group, the country’s largest, have objected to the ban and charges, though Doğan also took the unusual step of engaging in self-criticism, an action that has been critiqued by some. This ban on images of the crisis even extended to some degree to foreigners, as an Egyptian-British blogger had a tweet regarding the incident blocked based on the ruling of a Turkish court. In the days to follow it came out that the hostage takers did have family ties to the DHKP/C and that Kıraz had been actively investigating the Elvan case, perhaps even moving towards finding the police officer(s) involved. On the same day, the entire country suffered a massive blackout that has yet to be fully explained, though some hypotheses have been put forth. Twitter user Fuat Avni has received attention for tweets suggesting that the blackout was a trial run for a series of similar blackouts that will take place during the 7 June election, as well as tweets from January, noting that Turkey’s intelligence agency (MIT) had infiltrated DHKP/C and planned to reactive the group. On 1 April, two assailants attacked a police station in Istanbul and one was killed while, elsewhere in the city, an armed man broke into the AK-Party headquarters and hung a modified Turkish flag. Both President Erdoğan and Prime Minister Davutoğlu have attempted to turn the series of incidents to political advantage, Erdoğan noting that Turkey needs to build 3 rather than 2 nuclear power plants and saying that the police, who have recently been granted unprecedented powers, should take over for private security firms, and Davutoğlu promising that no unauthorized street protests would be permitted and also suggesting that the DHKP/C attack could be linked to foreign powers. Turkish authorities have blocked access to Twitter, YouTube and Facebook over the publication of photos published on the three social media platforms showing a prosecutor who was taken hostage by militants in Istanbul last week. Tayfun Acarer, the head of the Information and Communications Technologies Authority (BTK), told daily Hürriyet that the ban on Facebook had been lifted after it rapidly complied with the court ruling. 2 – Erdoğan insults roundup – Turkey has charted new territory in the crackdown on social media by giving a journalist a suspended prison sentence for “liking” an anti-Erdoğan post on Facebook. Radikal reports that a trial has been opened against ÖDP Tokat Regional Authority Önder Konuk, who was taken into custody because he called Erdoğan “lan” (something close to “dude”) in an angry tweet after the death of Özgecan Aslan. His tweet, which was only visible to friends, translates to, “Why don’t you declare a time of mourning dude!” He explained the tweet by saying he was angry to see Turkey declare a day of mourning for the death of the Saudi King, but not for Aslan. He may face up to 7 years in prison. Konuk is just one among many who have been charged for angry Tweets regarding Erdoğan’s actions in the wake of Aslan’s death. A 17-year-old high school student in the province of Konya is set to appear before a court in June and will face between one and four years of prison after he was charged with insulting President Recep Tayyip Erdoğan ; the boy is reportedly a friend of a 16- year-old who was recently arrested on the same charge. Thousands of social media users who either supported or opposed the ruling Justice and Development Party (AKP) engaged in a “spamming” war, which started April 3 and continued for at least two days, leading Twitter to suspend the accounts of many users who had hundreds of thousands of followers. A Turkish court banned accesss to stories ran by eight websites on Zehra Develioğlu , a headscarved woman who claimed in June 2013 that she and her baby were the victims of an assault by a group of people in the Kabataş district of Istanbul during the Gezi Park protests, upon a request by the woman. In related news, the journalist who “broke” the original story, Elif Çakır, had her Twitter account hacked, with the hacker admitting to wrongdoing on her behalf. Hollywood star Julianne Moore may have won the 2015 Best Actress Oscar, but Turkish officials have rejected a bid to make her Turkey’s tourism face by citing her “poor acting.” The Culture and Tourism Ministry disapproved of the acclaimed actress’ performance in a film promoting tourism in Turkey and demanded a reshoot. However, Moore declined the ministry’s offer, ultimately leading to the cancellation of the project, daily Hürriyet has learned. The story also received satirical commentary in The Onion. Turkey has seen increased pressure on media in recent years, part of a drift toward authoritarianism that has led to a pervasive climate of self-censorship and one of the most troubling press freedom pictures in Europe. 2 – A nationalist retelling of the Gallipoli battle, Son Mektup (Final Letter), released in honor of the 100th anniversary of the battle, has garnered some controversy as Kemalist groups question why Mustafal Kemal Atatürk, a national hero and by many accounts a key figure of the Gallipoli defense, was left out of the film. ODA TV, an independent and often anti-AK-Party news site, asks where the money for such a project came from and notes that the steel, energy, and shipping industry firm İÇDAŞ was a major sponsor. Radikal, meanwhile, notes that the Ministry of National Education has paved the way for the film to be shown to millions of school children across the country. Emine Yıldırım from Today’s Zaman provides a cinematic critique of the film in English. 3 – The Kabataş fiasco described in previous entries (here, here, and here) has taken a new turn, as Hürriyet columnist İsmet Berkan, who claimed via Twitter to have seen footage of the attack, thereby lending weight to a story which has since been widely discredited, issued an apology to his readers at the prompting of Hürriyet’s reader representative, Faruk Bildirici. The story was covered widely, including in Hürriyet, and Today’s Zaman (English). In response, AKP Adiyaman MP Mehmet Metiner says that he trusted Gülenist police directors who told him that they had evidence of the Kabataş harassment and that’s why he had announced that the AKP had such evidence. He says that he doesn’t understand why İsmet Berkan felt compelled to lie about such things during Gezi nor why he feels compelled to confess it now. President Recep Tayyip Erdoğan has filed complaints on charges of “ insult ing” him against a total of 236 people in the 227 days since he was elected president in the election held on Aug. 10, 2014. The Ankara Chief Public Prosecutor’s Office is seeking a prison sentence of two years for Gonca Vuslateri , an actress who works in theater and television, on charges of insulting President Recep Tayyip Erdoğan , who has so far filed more than 220 complaints against people for allegedly insulting him since he was elected president in August of last year. Two cartoonists for the popular satirical weekly Penguen have been jailed to 11 months in prison, over a satirical piece on free speech in which they were convicted of including a hidden gesture “insulting” Turkish President Recep Tayyip Erdoğan. Cartoonists Bahadır Baruter and Özer Aydoğan were sued for the Aug. 21, 2014, cover of the magazine, which satirized Erdoğan’s election as Turkey’s president. In the drawing, Erdoğan is seen asking whether officials at the new presidential palace in Ankara have prepared “any journalists to slaughter,” referring to ritual sacrifice in Islam, to mark his inauguration. According to Radikal, Penguen has released a statement regarding the 11 month prison sentence, noting that they are saddened that a trial can even take place against a cartoonist and that this is bad for the whole country, especially given the fact that there is no insult on the cover in question. They state that they will continue to draw cartoons and that they hope this trial is the final example of attempt to intimidate free expression. An investigation has been launched into a total of 58 well-known figures in Turkey on the grounds that they criticized the state-run Anadolu Agency on Twitter, daily Cumhuriyet has reported. Top journalists, including daily Cumhuriyet Editor-in-Chief Can Dündar, Hürriyet columnist Melis Alphan and Taraf columnist Emre Uslu are among the suspects, while the former general manager of the agency, Kemal Öztürk, and Vice-General Director Ebubekir Şahin are the complainants. The suspects have been accused of “provoking the people to hate and enmity, as well as defamation, slander and intimidation” for their posts on social media. Social media users who share content that has been subject to a legal complaint in Turkey will be punished, according an omnibus bill currently being debated in parliament, daily Radikal has reported. The Telecommunications Directorate (TIB) will be able to decide for the removal or blocking of Internet content based on an article about the “protection of national security and public order” in the omnibus bill, and users who share such content will also be punished. On March 20, parliament approved a key article of the contentious omnibus bill that gives power to the prime minister and other ministers to shut down websites within four hours. The approval came just six months after a similar bill was overturned by the Constitutional Court. A 21-year-old university student is facing the prospect of up to four-and-a-half years in prison for posts on Twitter that are alleged to have insulted President Recep Tayyip Erdoğan when he was prime minister. Two Turkish cartoonists face up to two years in jail on charges of “insulting” President Recep Tayyip Erdoğan, over a satirical piece on free speech in which they allegedly included a hidden offensive gesture. Bahadır Baruter and Özer Aydoğan, cartoonists for the popular satirical weekly Penguen, have been sued by Erdoğan for the Aug. 21, 2014 cover of the magazine. 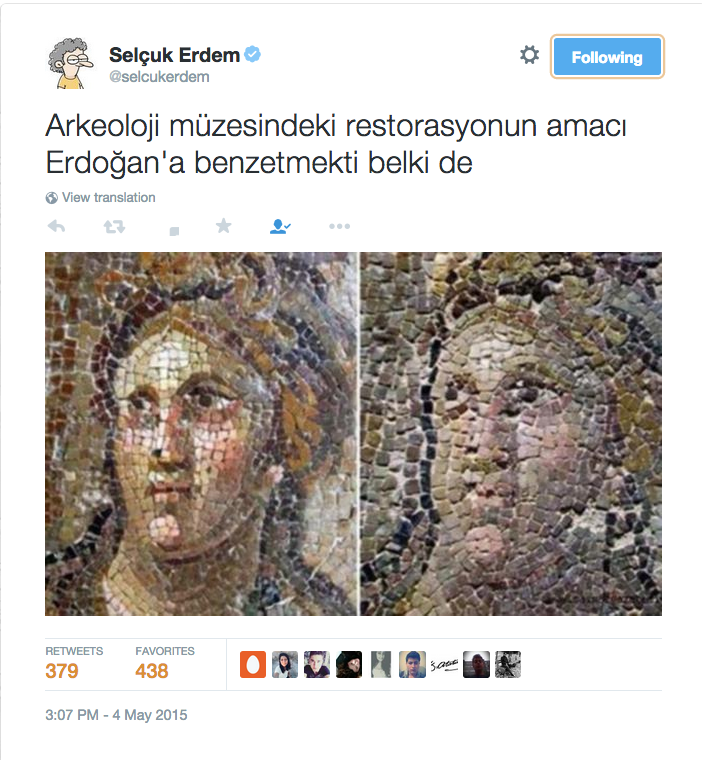 In the picture, Erdoğan is seen asking whether officials at the new presidential palace in Ankara have prepared “any journalists to slaughter,” referring to ritual sacrifice in Islam. A journalist in southern Turkey has been sentenced to a five-month suspended prison sentence, while the houses of two more journalists from the same city have been raided by police, all for “insulting” President Recep Tayyip Erdoğan on their social media accounts. Mine Bekiroğlu, a 28-year-old local journalist from Adana, was sentenced to a five-month prison sentence by Adana 6th Criminal Court of First Instance on March 19, Doğan News Agency reported. Turkey’s Supreme Election Board (YSK) has banned a television ad prepared by the ruling Justice and Development Party (AK Party) for the Nevruz festival because of the use of the Turkish flag and religious symbols, a news report said on Sunday. The three-minute ad was released last week to mark the Nevruz festival — a now officially recognized holiday widely celebrated in the predominantly Kurdish southeastern region of Turkey — to send a message of unity amid efforts as part of a settlement process to resolve the decades-old Kurdish issue through talks. The AK-Party is clearly aware that such use of symbols is illegal, as they had an ad banned for similar reasons almost exactly one year ago, in the run-up to the March 2014 municipal elections. More about that ad and its zombie-like imagery can be found at endtimescafe. 3 – Ileri Haber and T24 report that he Beyoğlu Zabita raided a screening of the 13th annual Filmmor Women’s Film Festival taking place in the Rampa Kafe, saying that the cafe didn’t have a license for screening. Festival coordinator Melek Özman noted that the festival had received all the necessary permissions from the Ministry of Culture and Tourism. The filmgoers resisted the police for about an hour, until organizers told the police they had called officials in the municipality and parliament, at which point the police finally relented. Parliament has approved a key article of the contentious omnibus bill which gives power to the prime minister and other ministers to shut down websites within four hours, just six months after a similar bill was overturned by the Constitutional Court. Parliament approved 13 more articles of the omnibus bill late March 12. A key article stipulates that ministers will have the power to order the removal or blocking of an online publication for “defending the right to live, securing property, ensuring national security and public order, preventing crime or protecting public health.” The Telecommunications Directorate (TIB) could enforce the request of the ministry, as a blanket ban of the website if deemed necessary, within a maximum of four hours. The same paper also prints an interview with scholar Aslı Tunç on the importance of social media in Turkey and the government’s strong efforts to curtail it. 5 – Censorship round-up – Hürriyet Daily News reports on members of the US Senate pressuring Secretary of State John Kerry to act on press freedom in Turkey; Today’s Zaman details a new report by Transparency International that says 86 percent of journalists in Turkey believe self-censorship is common; and columnist Melis Alphan notes the long history of censorship in cinema and art related to Kurdish identity.